Your Christmas wish has been granted! As a continuation of our Christmas Q&A series with London theatre’s biggest stars, we sat down with the jolly old West End Genie himself, Trevor Dion Nicholas. The hilarious American actor and self-proclaimed nerd has been playing Aladdin’s Genie at the Prince Edward Theatre since 2016. Anyone who has seen the show before can attest that he is an absolute riot! Read our exclusive Q&A with Trevor Dion Nicholas below. And if you just can’t get enough of Genie, then be sure to follow Trevor Dion Nicholas on Twitter! If you missed last week’s Holiday Q&A with Katharine McPhee of Waitress, you can read it here. Performing here at the Prince Edward Theatre, as well as finding any time I can to enjoy preparing a massive Christmas dinner in my new kitchen! 2. What’s your favourite Christmas song? 3. Can you name all of Santa’s reindeer (without the help of Google)? 4. Will you be seeing any theatre this Christmas? I’ll be seeing the inside of my own theatre, but I don’t know if that counts! Ha! 5. What’s the funniest gift you have ever received? I can’t remember my own, but I do remember in the early ‘90s when my teenage sister had kept asking for a Corvette all year leading up to Christmas. When Christmas morning came around my parents said they got her a Corvette and handed her a box that had the keys inside. When she opened the box all she found was a small-scale toy Corvette, she was furious while my other siblings and I all laughed. 6. What’s your go-to Christmas film? Again, I am completely obsessed with Gremlins, and have been since I was a kid. No snacks after midnight kids! 7. Have you ever 'regifted' something before? Absolutely not! That’s a Christmas faux pas! Only the freshest of gifts coming from me. 8. What are your Christmas traditions? Christmas Thumb Print Cookies is a tradition that started with my mother and with my older sister. I still make them every year. It makes me feel like home no matter where I am. 9. What do you hope to find in your stocking this year? Super Smash Bros. Ultimate for my Nintendo Switch! 10. Which person would you most like to meet under the mistletoe? Mrs. Claus herself, that’s a good woman who has stayed down and loyal since day 1. 11. Which Christmas food do you most look forward to? Eggnog, hands down. Let it flow like a river directly into my mouth! 12. What’s your favourite Christmas memory? My mother’s birthday is Christmas Day and for her 50th we had a massive surprise party for her with tons of friends and family. That evening, and her excitement and happiness, is still my fav. Aladdin will be taking his final magic carpet ride on 1 June 2019 as the venue makes way for the return of Mary Poppins. 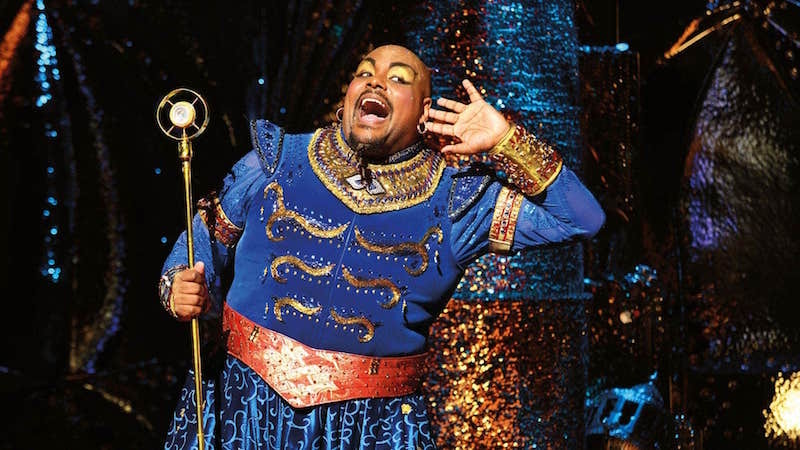 Your time is running out to see the award-winning performance of Trevor Dion Nicholas as Genie! Act fast to secure the last remaining good seats at the Prince Edward Theatre! Purchase your Aladdin West End tickets.